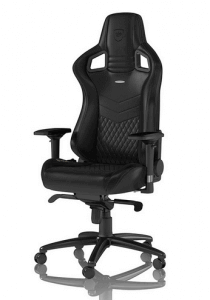 Noble Chairs have established themselves in the marketplace as a leader in quality gaming and office chairs. The Noble Chairs are designed in Germany and are said to be “inspired by the interiors of luxury sports cars.” Another thing that Noble Chairs stress is that their chairs made of real leather, they are certainly made for the Noble Gaming Chair connoisseur and yes, their price tag does reflect that. Given though that many of us spend an inordinate amount of time seated in our lifetime, we wanted to test out Noble Office Chair claims for ourselves. The Noble Chairs EPIC Series RL is it’s most exclusive chair. Its seat is made out of real leather and it boasts exquisite stitching and embroidery that you would expect for a chair in the 500 EURO price range. Noble Chairs are fully adjustable from the backrest to the armrests with an ergonomic design to help people who suffer from back and posture related issues. Let’s take a look at how we found it…. The Noble Gaming Chair arrives at our workshop and I am immediately greeted by a puffing and panting delivery man who manages to get it to our doorstep. I immediately see the branded Noble chairs box and am struck by the sheer weight of the box. I have reviewed other Noble Gamer's Chairs and this one is certainly the heaviest I have experienced. 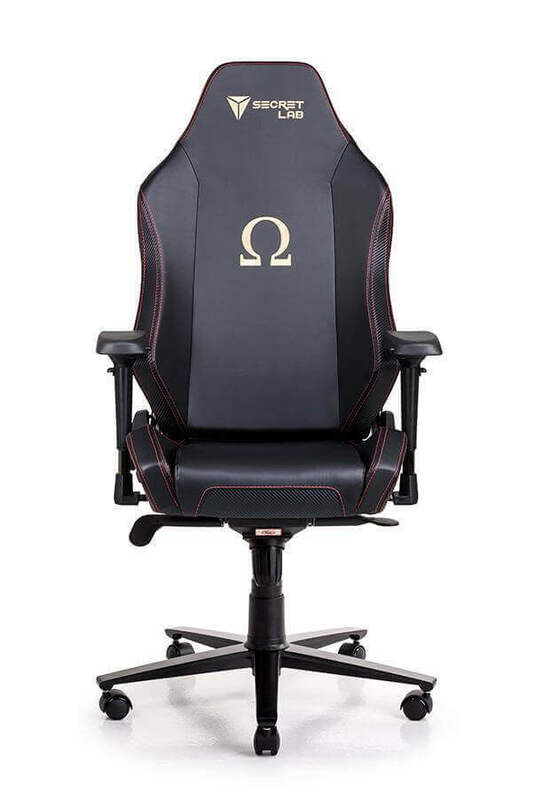 I open up the Noble Gaming Chair box to be greeted by the branded Noble chairs backrest with everything neatly ordered, as you would expect from a high-end price tag item. I meticulously take out the individual parts and am pleasantly surprised that assemble does not look too difficult, there are not thousands of screws and moving parts, also the instructions are step 1,2,3 and broken down into very clear to understand English. As I spread the contents out on my floor, I think to myself that today, I might finally assemble this Noble Office Chair in under an hour. ( I am about the least practical human being in the world). I decide to get cracking…..
Now as previously stated, I am about the least practical person in the world and as such can barely call myself a “real” man…. I tend to put things on back to front and make a hash of things so this will not be the most technical assembly review you will have read. I then attached the tilt mechanism to the seat which allows it to be adjusted, this consists of 4 easy to add screws that were no issue at all. I then added the hydraulics to the wheel base, the hydraulics take about 5 seconds to add and then the plastic covers a further matter of seconds. So far so good…. I then simply place the top of the chair onto the hydraulics to make it complete. Screw in the cosmetic side covers to cover up the screws and that should be it…. I stand back and look at my work, sure I have done something wrong as it took me about 25 minutes in total. I pull the adjuster lever to adjust the backrest tilt and it works a dream! I sit on the Noble Gaming Chair, expecting it to break or for me to have missed something but no, it is absolutely fine and I feel ready to call in the family and tell them I truly am a real man and to show them my creation. The Noble Gaming Chair does ooze style and class. It is obvious that Noble chairs are trying to attract the exclusive customer or the person that takes his chairs seriously. It has quite a retro look to me and whilst it is a gaming chair, I really see it as a classy office chair too. I have it in my office and next to my old chair (brand unnamed) it really stands out. It has a Regal gold logo and the stitching is impeccable. The finish of the chair is immaculate and exactly what you would expect when spending a bit more for quality. Sleek and understated, this Noble Office Chair would not look out of place in most office settings. The boxed stitching adds an elegant aesthetic which also serves a practical purpose. The padding is able to stay consistent and not get bunched up. The material used on the backrest and the seat has small holes to allow your skin to breath and keep you from overheating. Keeping cool while you work or game will allow you to keep going and stay focused on the job at hand. An understated yet classy design that is not the “racing red” style of many other gaming Noble chairs, this is for the distinguished gamer. The Noble Gaming Chair would fit into any office and certainly you feel like your money was well spent when you look at it. This Noble Office Chair and others are usually best bought on Amazon, because of their low prices, their tremendous reviews, and their fast shipping. There are other places where you can obtain these Noble Chairs but you may not get the same guaranteed quality or the same product, which is why we recommend ordering explicitly from Amazon. Noble Chairs are also sold directly from the USA and even filled in the USA, so you don’t have to worry about a lengthy shipping period from another country when you order. However, you do have to buy your own refill beans if you ever need to. Set up is very easy. The Noble Office Chair is all self-contained within the box it arrives in. It comes compressed, so once you take it out of the bag you will need to fluff it up as much as possible. Give it 7 to 10 days to come to its full size. Yes, this is quite a long time to wait, but the premium fill is different than typical memory foam and needs more time to come to its proper size. Your patience will be rewarded with one of the most comfortable bean bag chairs on the market. The filling is made with special foam peanuts called UltimaX and will conform to your body. The individual beans will pop right back into shape once you get up, but since they are small, they will need to be fluffed up occasionally to get the chair back to where you like it. As mentioned previously, the chair is made out of 100% real leather, in fact all of the materials used are high quality from the reinforced outer packaging to the solid steel frame and the quality backrest. In fact even the logo is embroidered into the chair in gold. Does all this matter? We will let you know in a year but for now it makes the chair seem to us like a thing of beauty, precision built and worthy of our hard earned Euros. Besides the good looks, the design is also ergonomic and will improve your circulation to your legs and up your back. This prevents fatigue and will keep you focused. Your posture is something you shouldn't even have to think about, so it nice to have a comfortable chair that automatically puts you in the best possible position that benefits your spine alignment. 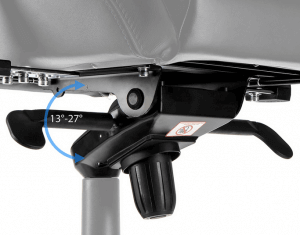 The lever on the right side of Noble Chairs are similar to that seen in cars which allows you to adjust the tilt of the backrest. From “overly upright” to “lay down for a massage”, almost horizontal, this chair has a tilt for backs of all shapes and sizes and games of all types. For use in the office you could have the more upright and posture friendly tilt, for gaming and relaxing you could tilt it back. It is very easy to adjust and everyone will have an idea of what they find most comfortable. 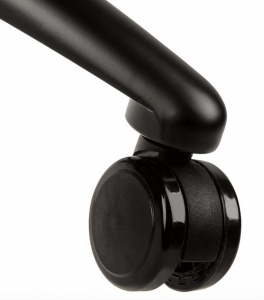 The Noble Office Chair arm rests are also fully adjustable. They easily move up and down and side to side to get the perfect arm position. This is a detail I have not had in previous Noble chairs and whilst it is not something I would actively look for in a chair, I am very pleased they have it. It allows me to have my arms positioned in the most comfortable place and as such adds to my overall enjoyment of the chair. If you are a big and tall gamer, you may need a little extra space in the seat area. Simply adjust the armrests out away from your body and you will have loads more space to move around without feeling restricted. Now if you like swinging in your gaming chair or office chair then this has a 10 out of 10 for the swing factor. My wife came in and swung in it then encouraged the kids to do the same. I had to leave the room as I could not bear to see them break my creation but it held up to the test and when I came back they assured me that it was the most swingable chair they had sat in….. each to their own. The Noble Gaming Chair is EXCEEDINGLY sturdy. I again tested this against other chairs we have tried and it is head and shoulders above the rest. The faux leather on my normal chair has a lot of indentation but the real leather of the Noble chairs a looks like it will take years to show any wear. I know at this point sounds gushing but I am trying to get across how solid it feels to sit in. The Noble Office Chair is sturdy and as such is quite heavy, I would recommend that you assemble it in the room that you built it in. The components are very solid and the solid steel frame adds a lot of weight to it. The chair is a very firm one. It is built to last and the real leather base means it is a firmer seat than my other Noble chairs or overly foam filled ones. I personally prefer this and it helped me to sit in a better posture without sinking into it too much. In the day, I use it as an office chair and have the back more upright and the chair slid under my desk to help me sit up straighter. When gaming, I tend to use the recliner to tilt the chair back which is my most comfortable position. I am only 2 weeks into using it but have had zero back problems (I tend to suffer from lower back pain) and I have been using the chair for 8 hours a day minimum. Comfort shouldn't be a luxury. If you are spending hours at a time in your chair, then you should expect to feel comfortable. Unfortunately, lesser chairs skimp out on the things that will let you feel like no time has passed. That one I have to say I will be better placed to review in the coming months. Everything points to this being a very durable chair. The high quality components and firm build would lead me to think it will outlast my other Noble chairs whose seats have lost their shape. I am 16 stone (of solid muscle…??) OK, 16 stone, and so I know a bit about warping chairs over a sustained period. My money would say that this one will hold its shape and also its functionality but I will be back to update this down the line. Cold cured foam is soft but very durable. Once it breaks in, it will feel soft as you sit on it, but it bounces back as soon as you stand up without getting compacted over time. Even at the maximum weight allowance, the foam will stay evenly distributed and as comfortable as the day you bought it many years later. When I first saw the Noble chairs price tag I thought in honesty, that they were trying to add a premium price and maybe could not justify it. I quickly saw the precision and love that had gone into it, from the packaging it came in to the detail that went into every component it uses. They tried to make the perfect chair and whilst there is not such a thing, I think they did a fantastic job. 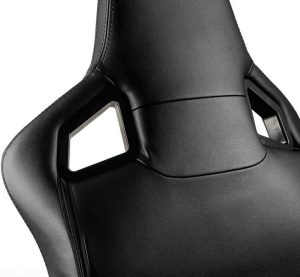 The Noble Gaming Chair will fit into a high-end office or gamers den and blend into each. Consider many of us spend hundreds of days a year in a chair and thousands of hours and suddenly it does not seem so extravagant at 549 EUROS. Add to that many people have bad posture, back issues and more and suddenly not investing in a chair like this seems a false economy! There are a lot of gaming chairs on the market, a lot are cookie-baked racing red and made of cheap materials from factories around the world. Noble chairs HAVE succeeded in making chair that shows they are both in the market to stay, love chairs and want to be the exclusive chair of choice. Up until now, from the Noble chairs I have tested, they have succeeded in their goal. Not the chair you're looking for? Give our chair finder a try and we'll find your chair-match. Hello Mark I just ordered my chair around a hour ago. I wanted to know how the chair is holding up? Don’t hesitate to email me back. GamingChairs.com is a participant in the Amazon Services LLC Associates Program, an affiliate advertising program designed to provide a means for sites to earn advertising fees by advertising and linking to Amazon.com, Amazon.co.uk, Amazon.ca, Amazon and the Amazon logo are trademarks of Amazon.com, Inc, or its affiliates.